MOSCOW. May 11 (Interfax) – Kremlin spokesman Dmitry Peskov has not confirmed reports that President Vladimir Putin is to meet with U.S. Secretary of State John Kerry in Sochi on Tuesday. “We will make an announcement if such a meeting takes place,” Peskov said on Govorit Moskva radio on Monday. The radio station said citing Peskov that no decision has been made yet on Putin’s meeting with Kerry. The Russian Foreign Ministry said earlier on Monday that talks would be held in Sochi on May 12 between Foreign Minister Sergei Lavrov and U.S. Secretary of State John Kerry. It also said that Lavrov and Kerry would exchange views on the current bilateral agenda and on the most pressing international issues. 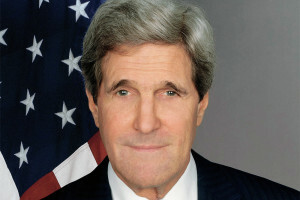 The U.S. Department of State in turn said that Kerry hopes to meet with President Putin in Sochi. It also said that in Sochi Kerry plans to discuss the entire spectrum of bilateral and regional issues, including Iran, Syria and Ukraine.